It's easy to take clean water for granted until your tap turns cloudy. Here, what this means for the safety of your drinking water—and how you can clear up the problem! Q. When I fill a glass of water from my faucet, it looks cloudy. What’s with all the the murkiness? More importantly, is it safe to drink? A. Your tap water is probably fine to drink, especially if it’s provided by your city or town. But since there’s always a small risk of contamination, it’s a good idea to stock up on a few gallons from the store while you take a few steps to track down the cause of your cloudy water. Clear the air. When air gets into water supply lines, the pressure of the water forces the air into tiny bubbles and disperses them, making the water appear milky right out of the faucet. To see if air is the issue, fill a glass and set it on the counter. If the cloudiness disappears in a few minutes, tiny air bubbles probably are the culprit—and your tap water is safe to drink. Try a sediment filter. Unlike air bubbles, organic particles won’t clear up after a couple minutes. The tiny specks of stone, rock, and soil are present in all tap water at low concentrations, but higher levels can make your water murky. 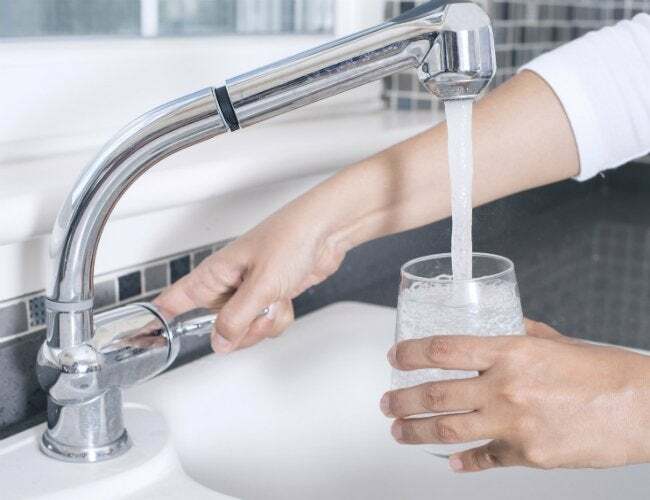 If your water is from a municipal system, installing an inexpensive sediment filter on your faucet will probably solve your cloudy water problem. 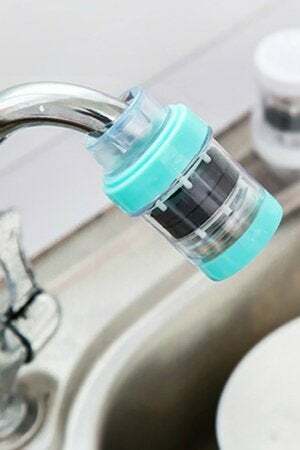 The filters use activated carbon cartridges to trap particles that improve the purity and taste of your water. Go back to the source. If your water comes from a private well, the cloudy water could have a number of different causes. Unlike municipal systems, private well water isn’t treated for contaminants. While the problem might just be air introduced to the lines from the pump or pressure tank, it could also be harmful residue, chemicals, or contaminants inside the well. To find out what you’re dealing with, take a sample to your local county extension office. They’ll send it to a lab to determine the type and concentration of any harmful substances, and offer treatment options. Follow the recommendations. Depending on the results that come back from the local county extension office, you may be able to clear up the issue with a sediment filter. If the cloudy water is caused by more serious contaminants, though, installing a reverse osmosis (RO) unit is probably the next step. By filtering water through a series of membranes, these systems catch up to 99 percent of contaminants, including chemicals like pesticides and chlorine. Once installed under the sink, the unit dispenses clean water right from the tap. Unfortunately, peace of mind doesn’t come cheap: Residential models start at $300 and go up from there. Test for gas. It’s less likely, but not impossible, that methane is the culprit. The non-toxic gas is most likely to show up in water from small, rural systems or a well close to an oil or gas line. To find out, fill an empty gallon jug halfway with tap water and set it aside for an hour to allow the gas to rise. When you open the lid, light a match at the top. Because methane is flammable, you’ll see the flame flare up if it’s in your water. The only way to remove methane from your water system is to have a plumber install an aerator on the water line leading into your home. This add-on allows the gas to escape safely into the atmosphere, and you’ll see clearer water from your tap.